Engines produce a lot of excess energy that escapes as heat and vibration, this effect creates a lot of noise. When the muffler was first invented for vehicles, the reduction in noise pollution was so significant that they can became an industry standard practically overnight. Modern mufflers are so efficient that many motorists might not even notice them until they stop working. Fortunately there are a few noticeable warning signs that indicate you may need to have your muffler replaced. Read on for more! The exhaust system helps distribute an engine’s excess energy more evenly, which actually improves a vehicle’s horsepower and fuel usage. When the muffler– a key part of your exhaust– runs into any snags or problems, the vehicle’s operator may notice reduced performance or poor mileage. Always monitor your fuel economy and familiarize yourself with how your vehicle performs under all conditions. Exhaust fumes are dangerous and you should not make a habit of breathing them in any concentration. That being said, knowing what healthy exhaust looks and smells like is important to monitoring your vehicle’s performance. Thick, billowing, smoke-like or coloured exhaust can indicate problems at several points along the exhaust system, including the muffler. Also note any changes to the odour of your exhaust and service the vehicle immediately if there are any trace of fumes in the passenger area. Muffler’s specifically reduce the amount of sound emitted from your engine and exhaust system. 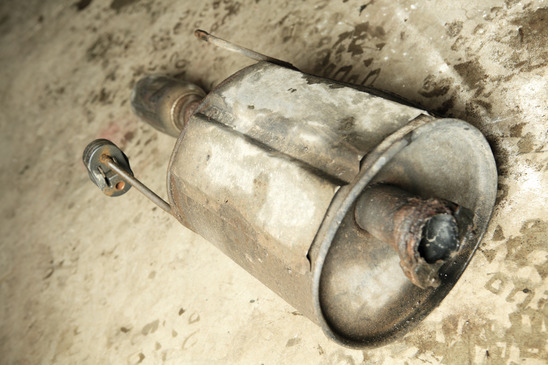 Knowing that, any increase in noise or vibration could be traced back to a faulty, damaged or worn out muffler. Be familiar with your vehicle’s standard running sound so your ear can pick out any changes as they happen. If you are experiencing any of the above issues, contact or visit Park Muffler today. Our techs are equipped to diagnose and complete any muffler repair or replacement — we’re so confident in our muffler skills, we put it in our name!